You will enjoy plenty of options for hiking along the Byway, from short walks to challenging mountain trails. 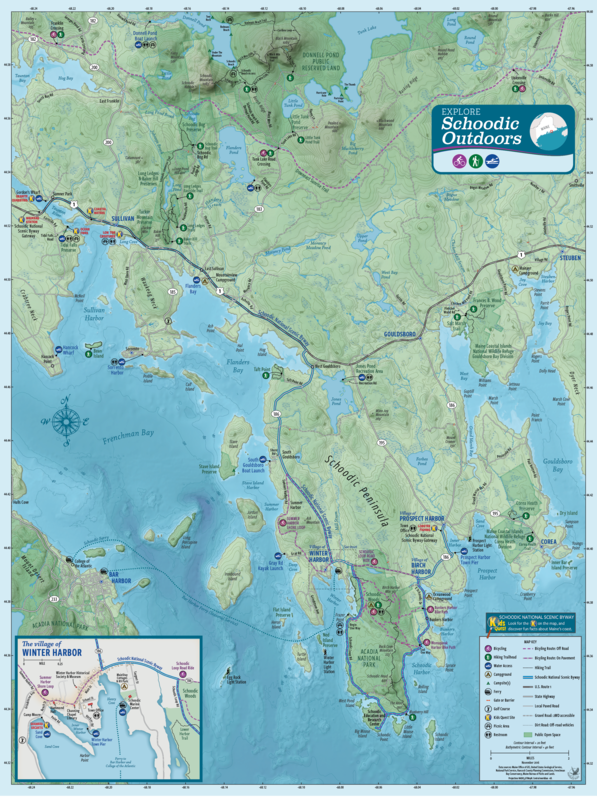 Schoodic Mountain Trails: Access from Route 183/Tunk Lake Rd to Schoodic Beach Rd. The road ends at a gate where you can park and walk a short distance to a small beach and picnic tables on the southern tip of Donnell Pond. This provides an alternate access for the Black Mountain trails. Black Mountain Trails: Access from Route 183/Tunk Lake Rd to Black Mountain Rd. The Conservancy has built and maintains a system of trails for public use—look for the blue blazes! Call 207-422-2328 or visit their website. Tucker Mountain: Access from old road bed informal parking area off Route 1 across and slightly to the east of the Long Cove rest area. Follow the blue (not yellow) markers. A steep trail from the old road bed leads to ledges that offer panoramic views. Trail length: 0.75-mile round trip. Baker Hill: Access from Route 1 to Punkinville Rd to parking (just south of Long Ledges). Woodland trails circle the preserve, and ledges provide views. There are two loop options (0.75 or 1 mi). Long Ledges: Access from Route 1 to Punkinville Rd to parking. There are several short loop trails (1 or 2 mi) winding through rock outcroppings with views to Schoodic Mountain. Schoodic Bog: Access from Route 1 to Punkinville Rd to Schoodic Bog Rd. Follow the trails, including dirt road, to the Down East Sunrise Trail where it meets the bog with great views of Schoodic Mountain to the north. Trail length: 3-mile round trip. Little Tunk Pond: Access from Route 1 to Route 183/Tunk Lake Rd, pass Donnell Pond Public Land sign to parking. Trail leads straight to the sandy beach with views of Black and Catherine Mountains. Trail length: 0.75-mile round trip. Taft Point: 65-acre point jutting into Flanders Bay with panoramic views across the eastern side of Frenchman Bay and Acadia mountains. Two loops available from parking lot off Taft Point Rd in South Gouldsboro. Bean Island: A 27-acre gem in upper Frenchman Bay between Hancock and Sullivan, accessible only by boat. Hancock Point wharf on Bay Ave is the closest launch. Enjoy the trail around the perimeter of the island with stunning views of Mount Desert Island. Corea Heath: Access from Route 1 to West Bay Rd/Route 186, then left on Route 195/Corea Rd to parking. The wooded loop trail provides overlooks of the bog and beaver dams, lodges and tranquil water flows. Great bird watching. Trail length: 1.25-mile loop. The Corea Heath Division of the National Wildlife Refuge is just south of the Corea Heath Preserve. Frances B. Wood: 438 acres adjacent to Maine Coastal Islands National Wildlife Refuge. Tidal estuaries, bogs, spruce forest, and excellent bird habitat. Located off the Fletcher Wood Rd in Gouldsboro. Petit Manan National Wildlife Refuge is one of the five refuges that together make up the Maine Coastal Islands National Wildlife Refuge. This map contains two wildlife refuge sites. Corea Heath and Gouldsboro Bay provide habitat for songbirds, shorebirds, and waterfowl, as well as opportunities for bird watching and hiking. Gouldsboro Bay protects 623 acres, including a large tidal salt marsh and mud flat. The Salt Marsh Trail winds through rolling conifer forest. Two observation platforms provide views of the salt marsh. Several pairs of bald eagles nest nearby, and waterfowl and shorebirds can be observed in the marsh. Trail length: 1.6-mile round trip. The 431-acre Corea Heath is considered one of the most significant peatlands in Maine. The Corea Heath Trail is a short wheelchair-accessible trail surrounded by stunted trees and shrubs heading to an observation platform overlooking the heath. Please do not walk on the bog; the plants are very fragile and can easily be damaged. Trail length: 0.4-mile round trip. Call the U.S. Fish & Wildlife Service at 207- 594-0600. The Schoodic District of Acadia National Park offers 7 miles of hiking trails, plus hiking on 8.3 miles of off-road biking paths. These trails link the ocean shore to the mountains, and offer a variety of hiking experiences. Schoodic Head Trail (0.6 mi), Anvil Trail (1.1 mi) and East Trail (0.5 mi) travel through spruce-fir forest to pine woodlands at the top of Schoodic Head (440 ft), the highest point on the peninsula. The easy Alder Trail (0.6 mi) provides a way to complete a loop to Schoodic Head from the Blueberry Hill parking area off the Schoodic Loop Rd. Buck Cove Mountain Trail (3.4 mi), combined with a portion (0.8 mi) of the bike paths, traverses the Schoodic Peninsula between Schoodic Head and the Schoodic Loop Rd near the entrance to the park. Lower Harbor Trail (1.1 mi) follows the shoreline along a quiet, narrow cove (see Winter Harbor inset map). Call Acadia National Park at 207-288-3338 or click here to go to their website.